1. Stef’s anxiety reaches a boiling point. 2. Jude is an influencer – in more ways than one. Well, in his own mind, at least, although Lena and an embattled Stef beg to differ. It seems the notoriety, money, and other perks associated with being part of 2 Gay Guys & A Girl are not only going to Jude’s head but also threatening his relationships. First, he’s too preoccupied with gaming to fold his laundry, and then he dispatches Taylor to placate Noah about his onscreen flirtation with Declan. 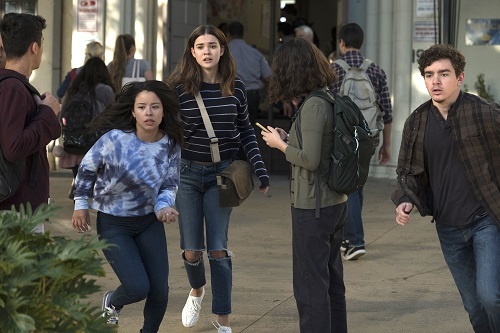 Essentially, the formerly sweet little Judicorn seems entirely too self-involved and manipulative during The Fosters 5×14. In a touching scene that calls back to when Noah and Jude first met, Noah says he’s OK with Jude pandering to the Declude shippers as long as the flirtation ends with the streaming session. However, Declan’s off-camera behavior indicates he’s looking for more. 3. Grace is getting her affairs in order. The Fosters 5×14 sees Grace’s largely uninvolved father appearing at the hospital ahead of her experimental treatment procedure. Brandon does his best to navigate the turbulent family politics, from Grace’s fear of seeming to favor one parent over the other to the fact that Grace’s dad once had an affair with her nurse, and his presence ultimately seems to do some good. By the end of the episode, Susan is comfortable enough to let Grace spend some one-on-one time with her father! Grace declares Brandon an “angel” – and, unbeknown to him, grants him medical power of attorney. That means he’ll be called upon to make decisions about her care if she’s unable to, a plot point that seems to be a harbinger of… well, nothing good. 4. Callie’s not here for any BS. At the end of last week’s episode, Agent Allen menacingly followed Callie home, but, surprise! Her friendly neighborhood ICE representative is eager to atone for his employer’s actions. Callie cuts right through his pretty words, asking, “What are you gonna do about it? Because, frankly, an apology doesn’t cut it.” In another nonsensical Riverdale parallel, she’s enlisted to capture footage of an upcoming ICE raid outside a school along with Aaron and Mariana. Needless to say, things get out of hand when Aaron is pushed into an ICE agent and summarily arrested. After Stef respectfully advises him to disclose he’s trans for his own safety, he explains to a guard that he won’t be safe in a men’s prison but doesn’t belong in a women’s prison either – and he ends up in solitary. When a distraught Callie meets with Agent Allen post-Aaron’s arrest, she has even less time for him than she did previously. Although he saw Aaron get pushed, he’s unwilling to say so in case sticking his neck out has a negative impact on his job, pension, family, etc. Essentially he wants to talk the talk without walking the walk, and he has no intention of backing up his words with actions that put him at personal risk. “What was your big apology all about?” Callie demands. “You feel bad for Ximena, but not bad enough to actually do something about it?” Surprisingly, the agent exceeds expectations and actually comes forward to corroborate Aaron’s story. 5. Aaron wants to step out of the shadows. Speaking of Aaron’s story, the events of The Fosters 5×14 inspire him to be more forthcoming about telling it. He acknowledges that although he was only in solitary for a short while, most incarcerated trans people aren’t so lucky. Moreover, he contends that “putting trans people in solitary because you don’t know what to do with them… that’s not a solution, it’s dehumanizing.” He tells Callie to include the scars from his gender affirmation surgery in the portrait she’s drawing, and announces he wants to be more open about being trans.